This year’s AGM will be held Tuesday, February 27 at 7:00 p.m. at the Amberwood Village Golf and Country Club (54 Springbrook Drive, Stittsville). The AGM is welcome to all members of the Bell Warriors Football Club. There will be Director and Executive reports, a financial year-end presentation and elections of officers for the 2018 season. Afterwards the Warriors will be holding a planning session to map out events, roles and goals for the upcoming season. The positions of the Executive shall be made open to the members for election at the Club’s Annual General Meeting (AGM). The term of office for the elected members of the Executive Committee shall commence following the AGM and continue until the next AGM. Each year at the Club’s Annual General Meeting (AGM), positions of the Executive shall be made open to the members for election on a schedule. The two year term of office for the elected members of the Executive Committee shall commence following their election and continue until the AGM two years hence. The election for President will be held at the AGM following seasons which are held in even number years. The election for VP Finance and VP Operations will be held at the AGM following seasons which are held in odd number years. New Executive positions which are created as outlined in Article VI Section A -X, will have elections as follows: 4th Executive Member election will be held following seasons which are held in even number years. 5th Executive Member will be held following seasons which are held in odd number years. A similar alternating election year pattern would apply if further Executive Members were deemed necessary to ensure continuity of experience at the Board level every year. Those interested in showing a greater level of support and involvement in the Club are invited to contact president@bellwarriors. It takes many hands to host our football programs and we rely heavily on the dedication and expertise of our valued volunteers. See you there! It is easy to feel exhilarated and immensely satisfied with the direction the club will be taking this year. We have 4 great men that have all stepped up to continue our club’s long and great legacy. We hand-chose each of them to take on this important responsibility and that’s because we have faith that no one would be better suited for the jobs. It is with absolute pride that we announce that Brian Patterson will be returning as our Tyke Head Coach. This will be Coach Brian’s 16th year coaching with our club and again this year, there is no one involved with the club that didn’t have Coach Brian coach one of their children at one time or another. He’s a true gem! At Mosquito, grizzled veteran Pat Kilmartin brings his 22 years of coaching experience to continue mentoring our players as our Mosquito Head Coach. Pat is respected as a passionate, caring and motivational coach that lives to build confidence and who truly admires spirit, dedication, responsibility ant team spirit. Thank you Coach Pat! Our Pee Wee Head Coach is going to be Paul Gowans who, way back when, was a Warriors player and Warriors’ Coach in an earlier life. Coach Paul has coached football for 28 years and is respected throughout the football community as an exceptional coach, leader and mentor. He has had numerous coaching roles at much higher levels and currently is a dedicated athletics teacher at South Carleton High School. On a editorial note: he coached both of my boys at South Carleton H.S. when they still had a football program and on every level, he earned my respect and admiration. Paul is back and we couldn’t be happier with that! Last but certainly not least is our new Bantam Head Coach Richard Baylin which has done nothing but win as a previous Head Coach at both Mosquito and Pee Wee. Coach Rich does it with such a positive, constructive and measured demeanour that he attracts families to our program. He sets the tone for what our program aspires to be. He’s a true gentleman that happens to have a passion for mentoring youth and football. What a perfect role model for our program, families and players! Thanks Coach Rich for stepping up. Join us in congratulating these experienced men on stepping up to steer this year’s tackle programs. 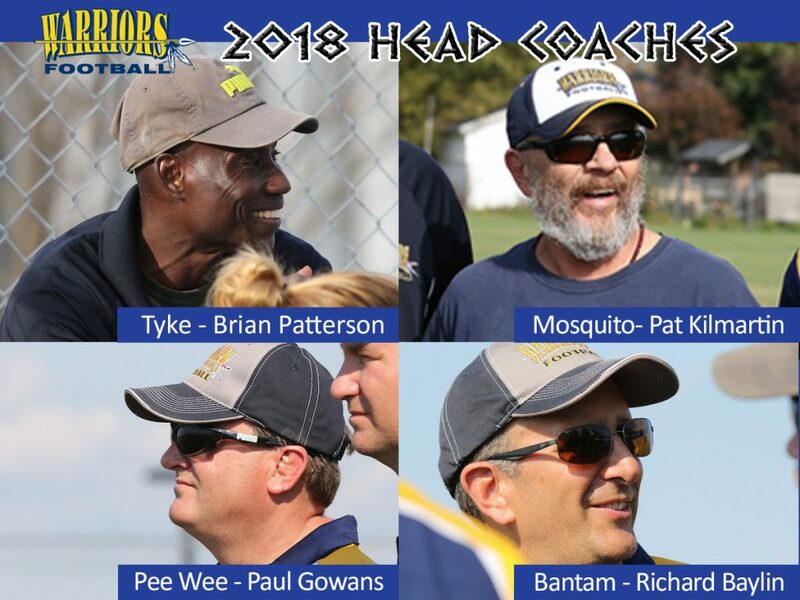 The Warriors will be playing in our 63rd year and we are so excited to have these four coaches leading the way. THANK YOU GENTLEMEN!!! What a day of celebrations the Warriors had. Our annual Team Banquets is so much more than just an award ceremony (but it is important to celebrate excellence too). Our Club has a very simple recipe to succeed that we embrace globally. …and that is……to work hard to challenge ourselves, to always strive to learn from our mistakes, to never get discouraged, to strive to grow and as importantly, realize that our actions impact those around us. If you follow our simple recipe, your actions will not only inevitably lead to your success, they will lead to successes of all your teammates who you inspire and motivate. There is lots to celebrate when we do that and ultimately, this is what our Warriors celebrated Saturday at our day long of hosting of two annual Team Banquets. 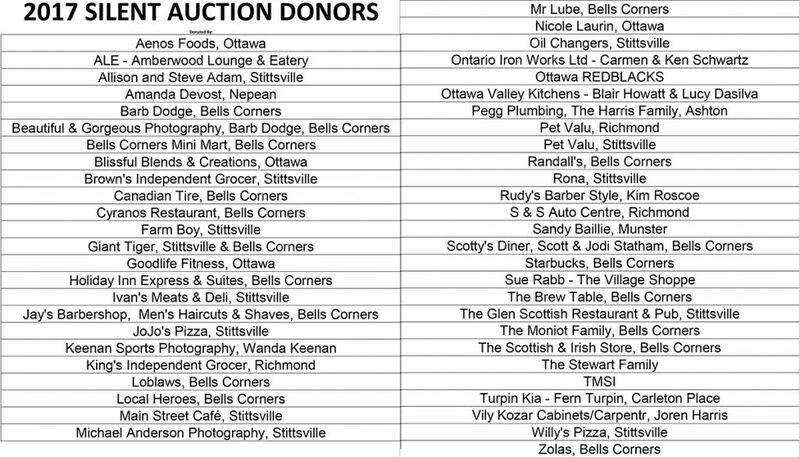 For all of our volunteers that helped with the setup, administration and tear down of the auctions, THANK YOU. Your hard work helped us raise a record $6,500 for our Warriors! 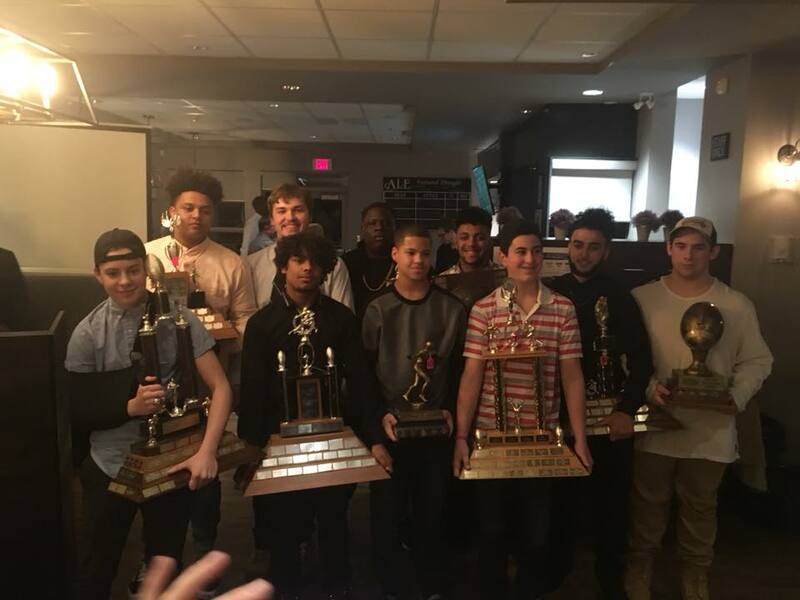 BANTAM: Front Row (L to R): Jacob Smith (DB); Armando Pascual de la Cruz (Best D-Player); Dakarai Baskin (Rookie); Michael Fiorino (Most Improved); Alaa Erdawi (Most Versatile); Brandon Graff (Leadership Award). Back Row (L to R): Trey O’Brien (MVP); Ethan Ryan (Best OL); Shyreek Phillips (Best DL); Kahir Padamshi (Coaches Choice);. 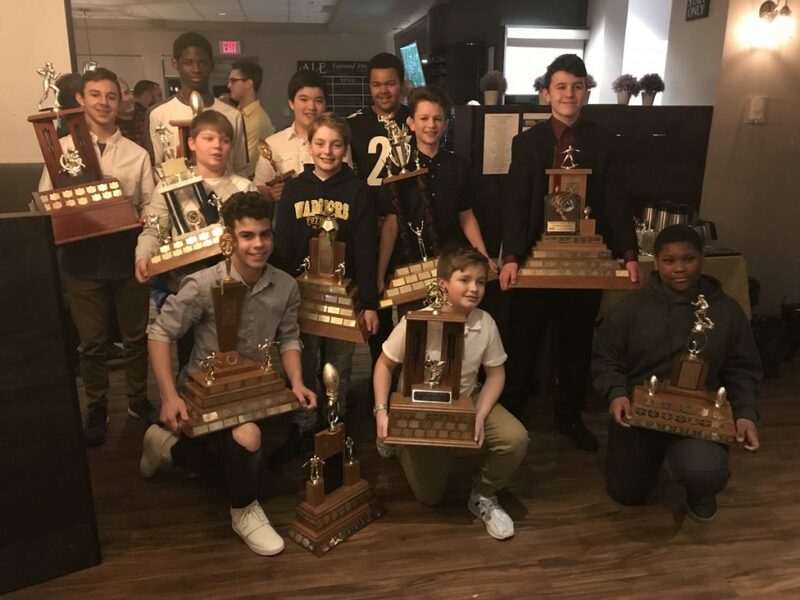 PEE WEE: Kneeling (L to R): Owen Lavigne (Warrior Award and Best D-Player); Elliot Fleming (Best DB); Arland Alvarez (Rookie). 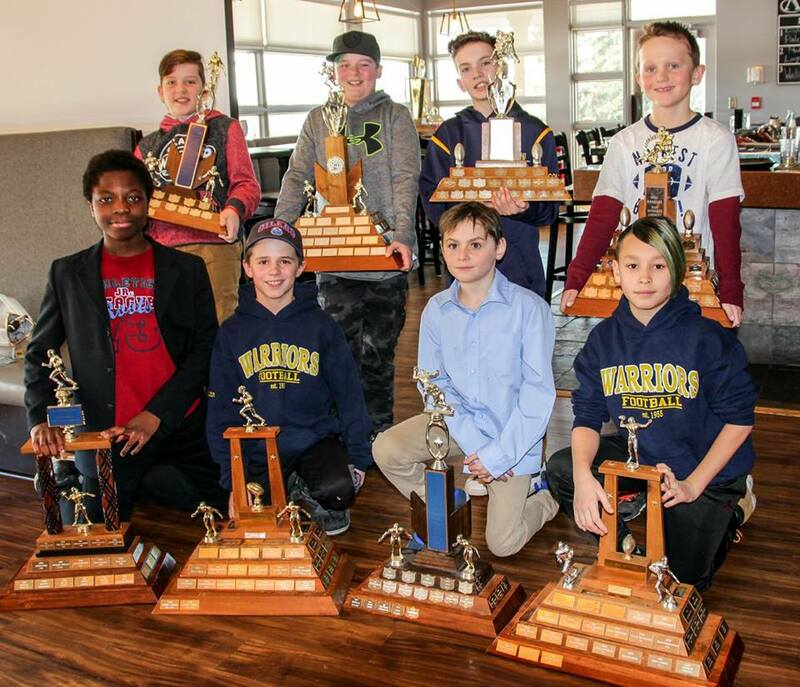 Second Row (L to R): Ryan Morissette (Coaches Choice); Avery Osborne (Best O-Player); Zachary Baylin (Most Versatile); Daymein Davidson (Best OL). Back Row (L to R): Tyler Baigent (MVP); Jeremie Catalusi (Outstanding LB); Lee Kubsz (Best DL); Isaiah Markell Ayalugo (Most Improved). MOSQUITO: Front Row (L to R): Joshua Olubajo (Best Offensive Back); Mason Quinn (Best OL); Tyler Gordon Davies (Best D-Back); Jacob Wong (Best O-Player). Back Row (L to R): Mason Jude (Coaches Choice); Alex Moniot (Best OL); Colton Lusk (Rookie); Matthew Lohnes (Best D-Line). Absent: Nolan Dulmage (MVP); Connor Murray (Most Improved); Alexander Smith (Best OL). 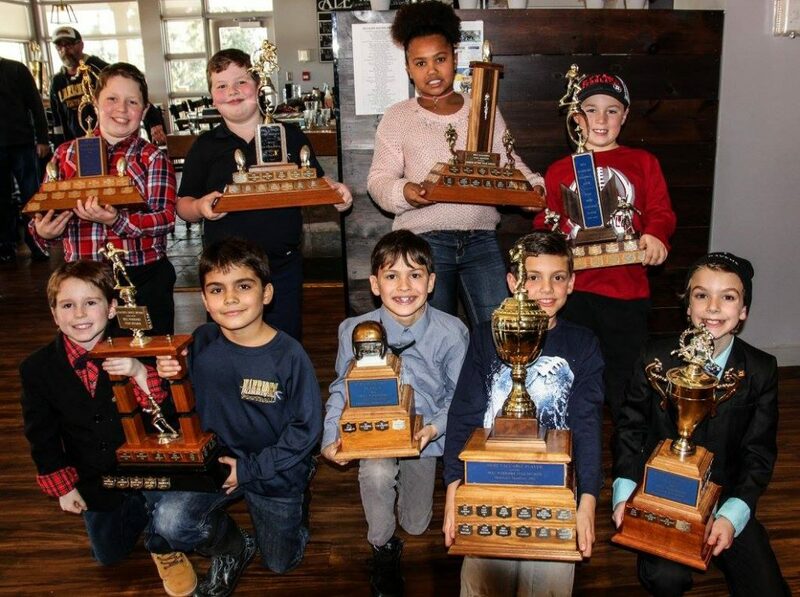 TYKE: Front Row (L to R): Avery Stuart and Rylan Gonzalez-Lee (Coaches Choice); Kingston Pappas (Best D-Player); Louis Turpin (MVP); Mohamad-Ali Saad (Best O-Player). Back Row (L to R); William Fortier (Best O-Line); Devin Swire (Best D-Line); Mariah Markell-Ayalogu (Rookie); Dylan Danby (Most Versatile). Absent: Daniel Salakor (Most Improved). 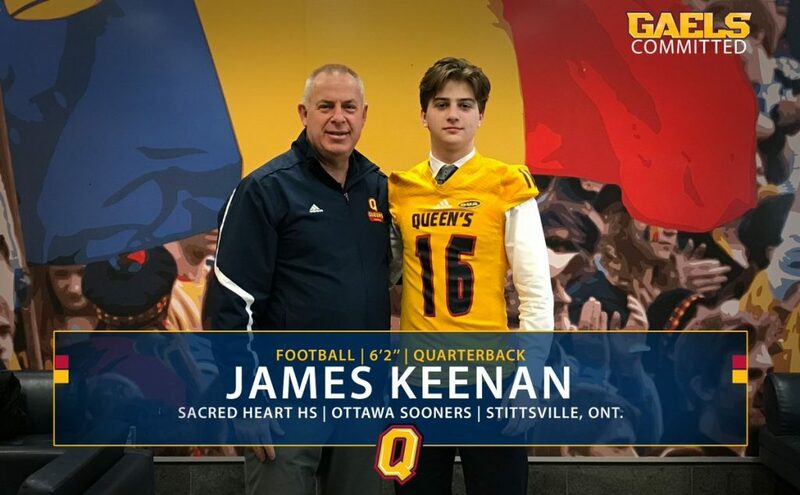 James is a QB out of Stittsville, Ontario that played from Tyke through Bantam for the Warriors. He played his last year in 2016 guiding his Bantam Warriors to the A-Cup Final.